Now is the time to plan for an amazing new year, and ReaMark is here to help! If you are looking for a fresh and consistent marketing tool to grow your real estate business, be sure to check out ReaMark’s new line up of recently released recipe post cards. These realtor post cards have 12 brand new recipes, all with terrific artwork. These quality cards are designed on thick, 12 pt. card stock that is coated to be long-lasting. Vibrant colors make them attractive and attention-getting. 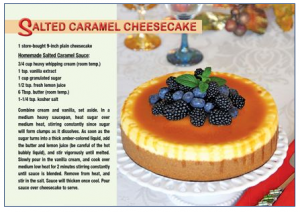 You can be assured that each recipe has been tried by the ReaMark staff, and all have been specifically chosen to not only be delicious, but easy to make with simple to find ingredients. Clients and prospects alike will love these cards. Many agents and brokers have found real estate post card marketing an effective way to farm leads. When you send out these recipe postcards once per month, you are building your name recognition and brand. You’ll find prospects looking forward to getting these recipes and sharing them with their friends. It is the perfect combination of direct mail and “word-of-mouth” marketing piece…all in one! We can even mail the cards for you or ship them for you to send yourself. Order 5 months of recipe post cards now and receive 1 month free! When you work with ReaMark, you are dealing with a company that specializes in marketing products for the real estate business. We understand your mission and your goals and we provide products designed to help you reach those goals. The key is visibility and consistency and our new line up of realtor recipe cards help deliver both. We are the only real estate marketing company that still offers our products through a mailed printed catalog. If you prefer, you can order online through our 2,000 item website. When you call ReaMark, you will talk to a real person who can help you quickly complete your order. We offer fast turnaround times and free professional designers who can customize your marketing piece. Our creative and effective real estate marketing pieces help you get more prospects, more leads, and ultimately more sales. Contact ReaMark today! Choosing the right real estate promotional items is critical when farming a neighborhood for listings. As we head towards the Fall season, calendars are the perfect way to touch prospects and acknowledge your current customers. Calendars are a popular item for many professions, but ReaMark focuses on designs and concepts specifically for the real estate industry. We select calendar options proven valuable to real estate agents and brokers throughout the country. ReaMark’s brand new Home Tips Calendars for 2015 are quality, tear off magnetic calendars that will stay on refrigerators in homes for a full year. Because these calendars provide new home tips each month, your name is associated with this valuable information continually. Choose from business card magnets peel and stick style calendars or have your business card reproduced directly onto the calendar. 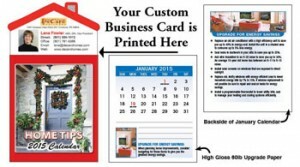 You can also have your business card reproduced on a house shaped magnet as well. We even offer free custom design from our in-house professional designers to further customize your calendars. Each calendar comes with its own “A Gift for You” envelope for individual distribution. Calendars are produced using beautiful photos with reinforced pages to last the entire year. If you are a real estate professional and select only one promotional marketing piece per year, this should be it! It is important you get your calendars ordered and distributed early to take full advantage of the season. Order now and save 20% off your order! ReaMark specializes in providing the real estate professional with powerful and effective promotional tools that work. Our marketing pieces will help you acquire more leads, listings, and sales. Our in-house professional design team can help create a look just for you! We believe in personal service. We are the only real estate marketing company that still creates a physical catalog that we mail directly to our clients, and we constantly update our website of over 2000 products. When you call ReaMark for your real estate promotional products, you will have the opportunity to talk to a live customer service representative. These representatives are trained to help you choose the items and options that will work best for your business and your budget! New Newsletter Designs out TODAY! Real estate newsletters are a terrific way to farm for leads and listings. They demonstrate your expertise as a real estate professional and personally reach out and touch your prospects and customers. When used regularly, they help brand your business and position you as a leader in your field. ReaMark’s latest real estate marketing newsletters are a half-fold design, created using attention-grabbing, vibrant color printing. Two large custom areas are included to allow you to add your own customized designs and content. These areas have proven to be a powerful and popular way to build real estate listings and sales. It also makes your newsletters much more personal. ReaMark is pleased to offer free custom creative from our team of in-house professional designers. They will work with you to create a message suited to build your business. Also ask us about our custom direct-mailing services. ReaMark focuses on helping real estate professionals grow their business through promotional and marketing pieces created specifically for agents and brokers. When you call ReaMark for your real estate marketing products, you will talk to a real person who can help guide you through your options. We are the last such company that still produces a physical catalog we mail to our clients. We also offer fresh products updated on our 2,000 item website. Why wait? Order now and save 15% on your Real Estate Newsletter order and get more leads, listings, and sales today! Football season is just weeks away. As the most popular sport in America, football appeals to men, women, and children of all ages. Why not take the hometown advantage this year with your real estate marketing and provide magnetic football schedules for your farm? Your magnet is sure to go right onto the fridge and remain there at least through February, possibly longer. At Reamark, we believe in only the best for our clients. That’s why we print on 25mL versus competitors who only use 15-20 mL. This gives the magnet quality your farm can feel and ensures that it will stay on the fridge. Our Magnetic Football Schedules come in several different varieties and are also fully customizable. 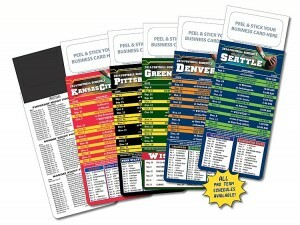 Choose from professional NFL teams, college teams, or create your own custom schedule for your local school. We offer free, in-house professional design and can have your proof to you in 24-48 hours. Schedules usually ship within 5-7 business days. Order now so that your magnet reaches fridge for the beginning of the season. Save up to 35% if you order by September 15th.